A few years ago Frank Coolen told me he had bought a book by W.A. Sherrill which was quite unknown in the world of Yijing students. Indeed, the book is so rare that isn’t even listed in I Ching – An Annotated Bibliography. Naturally I also wanted to have a copy of this curious book, so with a lot of searching on the internet, and by paying way too much money, I was able to obtain this book. Sherrill is mostly known by his co-authorship with W.K. Chu. They wrote An Anthology of I Ching, which gives some divination techniques that are (sometimes loosely) associated with the Yijing, and The Astrology of I Ching, which is their adaptation of Heluo Lishu, a kind of numerological system that calculates birth and life hexagrams. They were both good friends with Nan Huaijin 南懷瑾, a well-known Buddhist teacher. Sherrill’s book Heritage of Change – a Background to Chinese Culture and Thinking is written as an introduction in the Yijing and Chinese culture and philosophy from a Westerners point of view. I must confess I have never read it thoroughly. The contents does not really appeal to me, I am not interested in philosophical explanations. But I am sure others will find it a joy to read and many might find the book stuffed with a lot of intriguing concepts and information. At first glance the houtian bagua 後天八卦trigram circle seems devoid of any symmetry. It seems as if the trigrams follow each other in a random order, and that there is no logic behind it. But if we look at the circle in the way we are taught in the Ten Wings, namely as an order linked with time, patterns start to emerge. 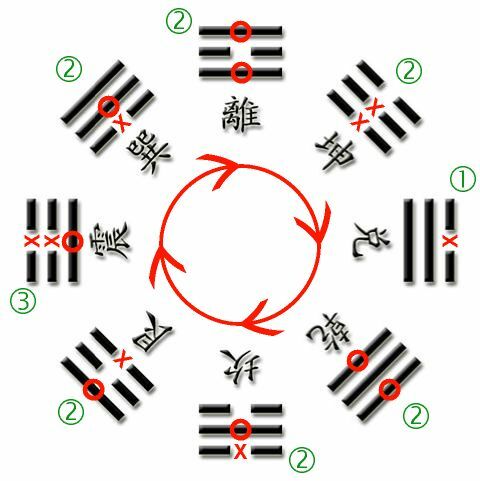 In the Ten Wings the trigrams are described in the sequence of the houtian circle, starting with Zhen 震 and going clockwise, ending with Gen 艮. 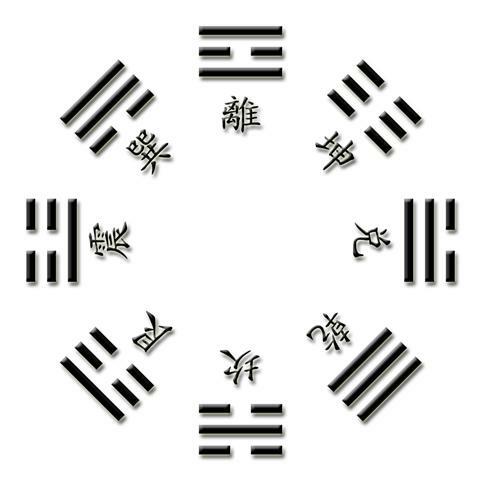 The trigrams are supposed to follow each other in time – Zhen 震 and Xun 巽 are linked with Spring and morning, Li 離 and Kun 坤 with Summer and midday, Dui 兌 and Qian 乾 with Autumn and evening, and Kan 坎 and Gen 艮 with Winter and midnight. In time, the trigrams change in each other – Zhen changes in Xun, Xun changes in Li, etc. In Zhen 3 lines change to make Xun; in Xun 2 lines change to make Li; in Li 2 lines change to make Kun, etc. There is a balanced sequence in the amount of changing lines: 3 – 2 – 2 – 2 – 1 – 2 – 2 – 2. The major change takes place in Zhen: the start of a new year and a new day. It seems as if the line created by the pair Zhen – Dui, the symbols of sunrise and sunset, divides the circle in half. The trigram pairs created in this way are each others pangtonggua 旁通卦 and fangua 反卦. A pangtonggua is the inverse of a trigram: a yin line becomes a yang line and vice-versa. A fangua is the trigram turned upside down. Xun is the combined pangtonggua and fangua of Gen; Li is the ptg and fg of Kan (although the fg is not visible because the trigram is symmetrical); Kun is the ptg and fg of Qian; Dui is the ptg and fg of Zhen. If I would switch the trigrams Zhen and Gen the circle would even be better: that way every trigram would be opposed to its ptg, and no fg would be necessary. Also the changing lines sequence would become more symmetrical: 1 – 2 – 2 – 2 – 1 – 2 – 2 – 2. It surely makes room for speculation…..
One of my favourite sites is the site of the National Palace Museum in Taiwan. Beautiful pictures and a lot of information. Check for instance the section with past exhibitions. My favourite one is A Special Exhibition of Bronze Inscriptions from the Western Chou. The introduction is a good entry into the world of bronze inscriptions. Other ones are Ancient Writing from the Ruins of Yin (about oracle bones) or a Special Exhibition of Shang Period Ritual Bronzes. I can spend hours on sites like this. Books can make me happy, but the book I received today thrills me with excitement. 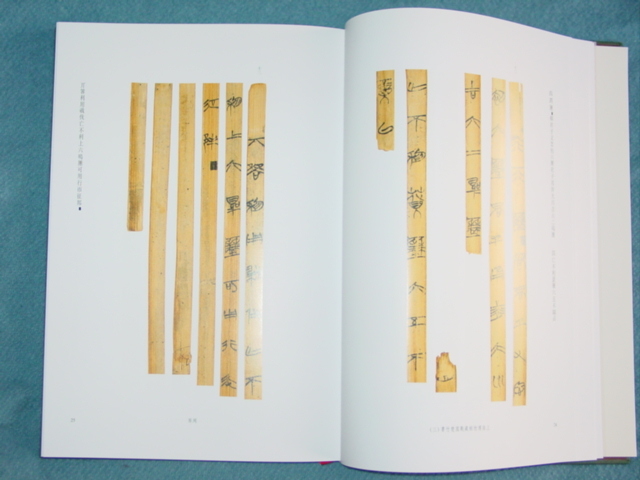 I finally received a copy of the Chujian Zhouyi, aka the Shanghai Museum manuscript of the Zhouyi (to read more about it see Edward Shaughnessy, A First Reading of the Shanghai Museum Bamboo-Strip Manuscript of the Zhou Yi, forthcoming). 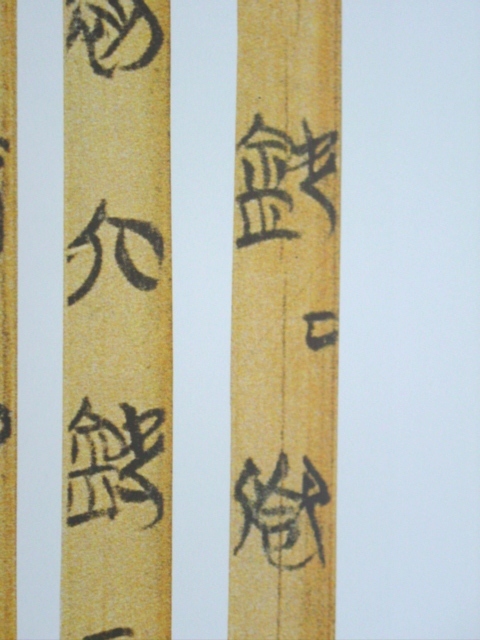 It is the oldest (but not complete) copy of the Zhouyi we have today; it is estimated around 300 BC. 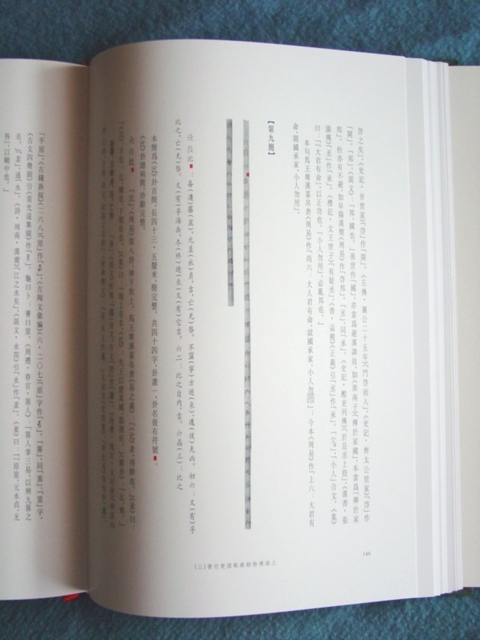 (…) this third volume is sumptuously produced. 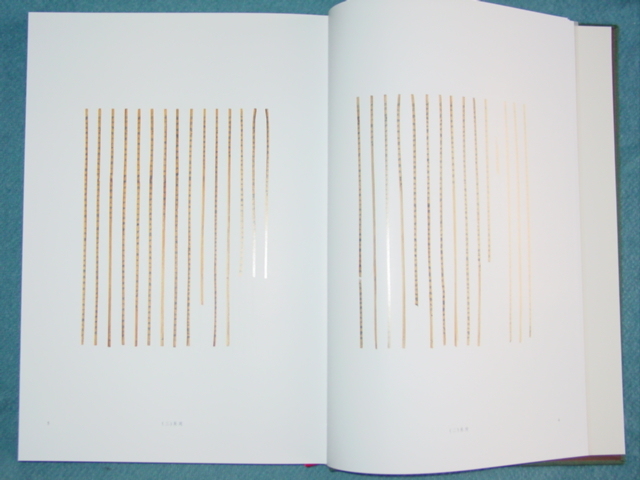 It begins with a two-part section of photographs of all the strips: first, half-size full-color photos of all of the strips arranged in what the editors believe was their original order, and then enlarged full-color photos in which each strip occupies a single page. This introductory section is then followed by an 83-page section of transcription and detailed commentary written by Pu Maozuo 濮茅左, a senior curator at the Shanghai Museum. As in earlier volumes, this section begins with a brief overview of the text, including its physical properties, format, general paleographic considerations, and, in this case, the place of the manuscript in the textual history of the Yi jing. This section proper consists of strip-by-strip presentations of the text. Also as in previous volumes, each strip is introduced by yet another photograph, this one full-size and black-and-white (though certain symbols that are red on the original strips seem to have been hand-colored in these photographs). There then comes a detailed description of the physical characteristics of the strip, including especially notation of any breaks and/or rejoinings. 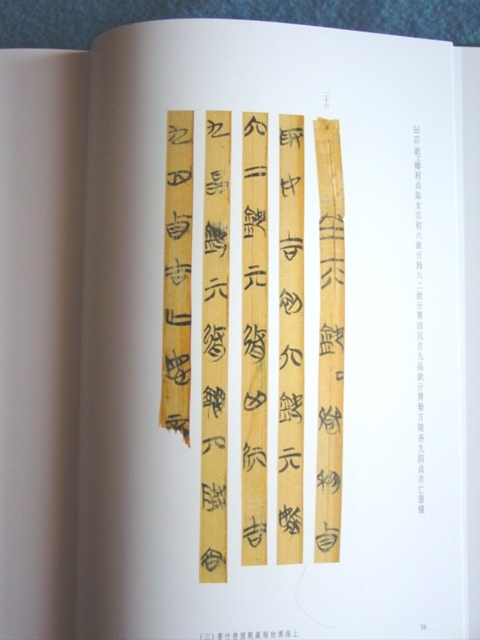 Finally comes a phrase-by-phrase discussion of the text on the strip, each of which is followed by how the phrase reads in the silk manuscript of the Yi jing that was discovered thirty years ago at Mawangdui 馬王堆, in Changsha 長沙, Hunan, and also how it reads in the received text. 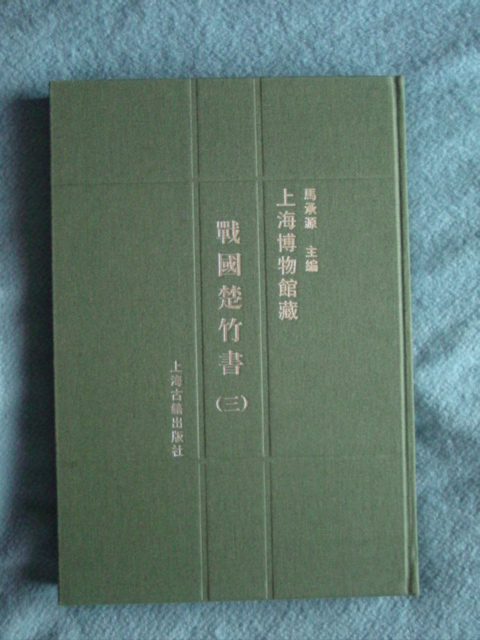 The presentation of the Zhou Yi includes also two appendices. 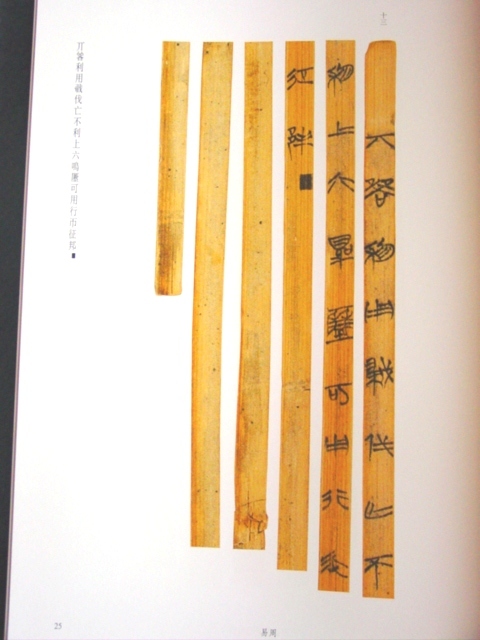 The first, 35 pages long, is a line-by-line comparison of the Shanghai Museum manuscript, the silk manuscript from Mawangdui, and the received text of the Zhou Yi; entries for both the Shanghai Museum and Mawangdui manuscripts include both photos of the original manuscript and also direct kaishu 楷書 transcriptions. The second appendix, 10 pages long, is a study of six different black and/or red symbols that are included with each of the hexagram texts of the manuscripts. Publication of the volume was delayed apparently because of a flaw in the coloring of these symbols in the first print-run, necessitating the withdrawal and reprinting of the entire edition. This is a manifestation of the care that has gone into the editing and publication of all of the Shanghai Museum manuscripts. Although this volume, like most paleographic publications, has already met with various types of criticism, mainly from scholars in China, the scholarly world is surely much in the debt of all those who have worked so hard to make these manuscripts available. The book measures 44 x 30 cm in size, the quality of the paper, printing and binding is excellent, in all, it is a pleasure to look at. I don’t even dare to read it, afraid that I will spoil the pages! The next few weeks I will examine the book and the manuscript carefully. If I find anything interesting (of course I will) I will let you know. Below are some samples of pages.